For the past week leading up to the day itself, many of my friends asked if I were going for the rally. I have always answered noncommittally, shrugging my shoulders, and not giving any answer at all. But two nights before the rally, I made up my mind. I was whatsapping with bb, and he asked if I was going. I told him that I wasn’t sure if I should go, considering what happened last year, and if I would be able to take it. But I wanted to go, because I wanted to stand for what I believed in. What sealed my decision to go was bb’s response, when I asked if he would go with me. He said yes. So I thought, ok. We’re really gonna do this. 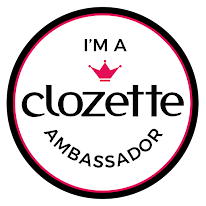 I read up on what to prepare, what to do in case something happens, I asked around, basically, I did everything I could to be prepared. D-day arrived, and I was reading tweets from those who were already there. The situation seemed peaceful enough. When bb finished his camera workshop, we ‘suited up’ and left for the Taman Bahagia LRT station. 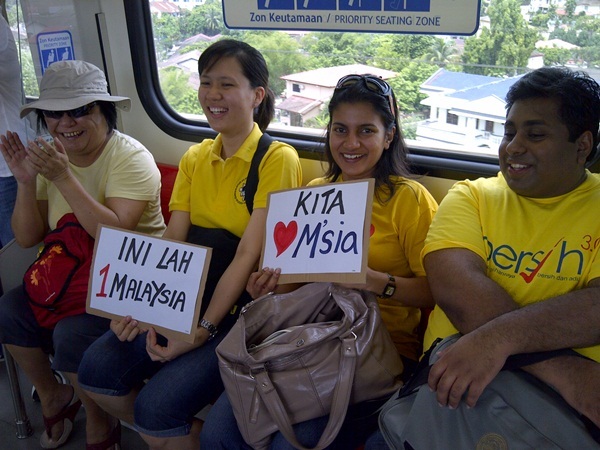 We got on the LRT, and were greeted by people sporting yellow shirts and holding banners saying “We Love Malaysia”. I remember talking to bb and we were saying it might not be that bad this time around considering it wasn’t really a ‘perhimpunan haram’. 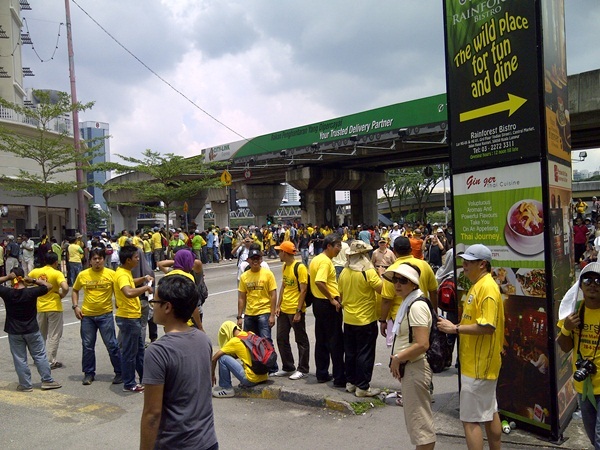 When we got to Pasar Seni station, we met up with Tsu Chong and the rest. 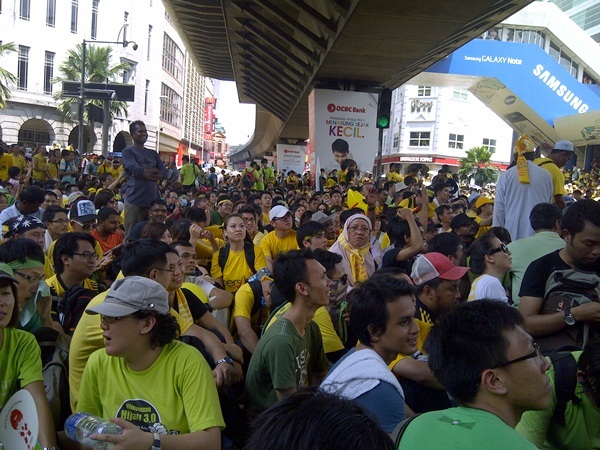 We saw many people milling about, waiting for the order to march towards Dataran. 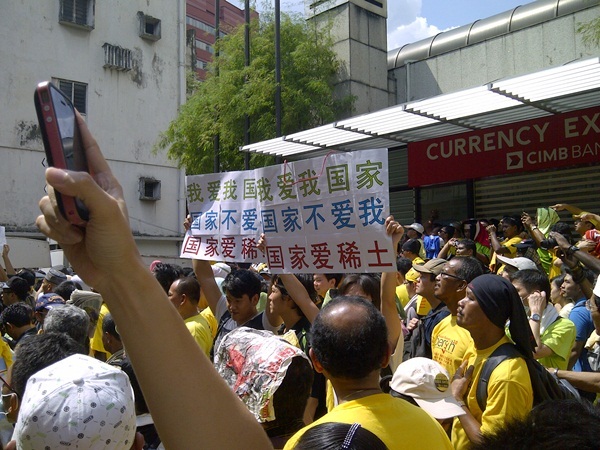 Our curiosity was piqued when we saw Anti-Lynas and Bersih banners being floated around. 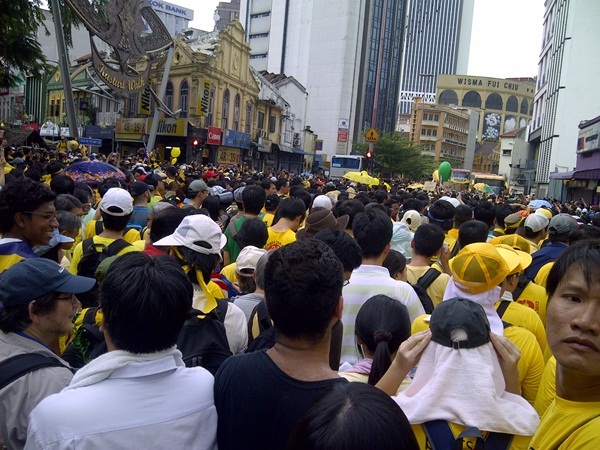 We went with the flow and before we knew it, we were already marching with the crowd towards Dataran. On my way there, I managed to look around, and I am amazed at the many different people I see. 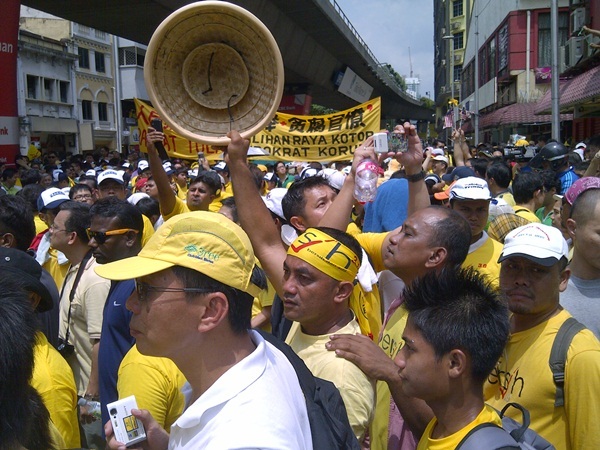 There were so many people from different backgrounds, and you think to yourself, wow, all of these people want to see change and electoral reforms for a better Malaysia. There were so many people there, but there was no violence at all. 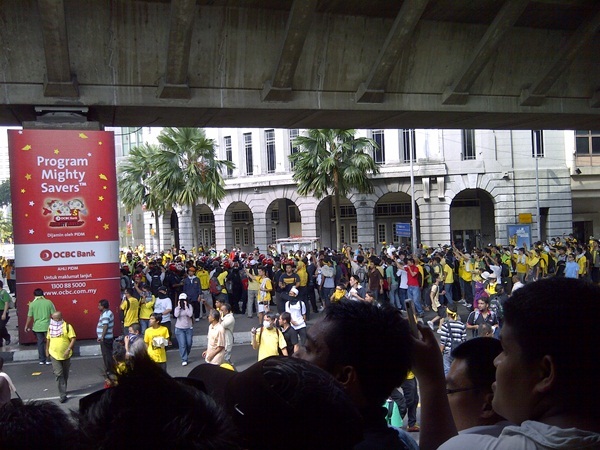 Eventually, we made our way to the Masjid Jamek LRT stations. It was hot and the McD and Burger King was packed. Even the little kedai runcits had their fridges cleaned out of cold water. There were people every which way we looked. The crowd was sitting down, and the scene was relatively calm. After a while, we saw Dato' S Ambiga giving a speech, and she said that we had already achieved our aim, and that we should disperse, and go home. 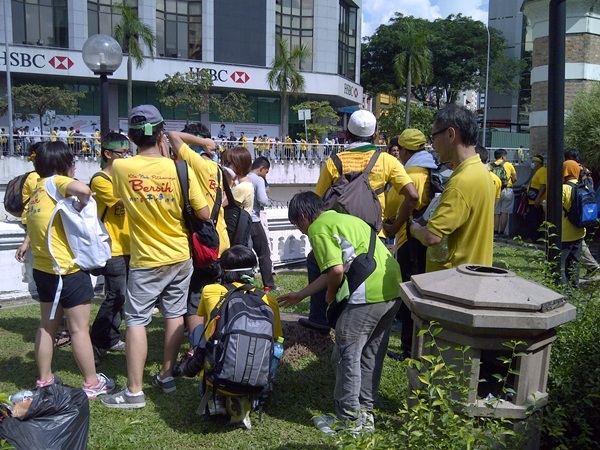 The Jabatan Amal volunteers walked by us and kept repeating “bersurai, bersurai” which meant ‘disperse’ in Malay. Ambiga, but she was blocked by the fella that stood up -.-"
But us being Malaysians, many of us pushed ahead, maybe because we didn’t really understood what they meant by bersurai, whether they meant bersurai now, or they are gonna bersurai first, then converge elsewhere. But we followed the crowd, albeit a little blindly. Those in front started crying out, “buka buka” for the barricades to be opened. 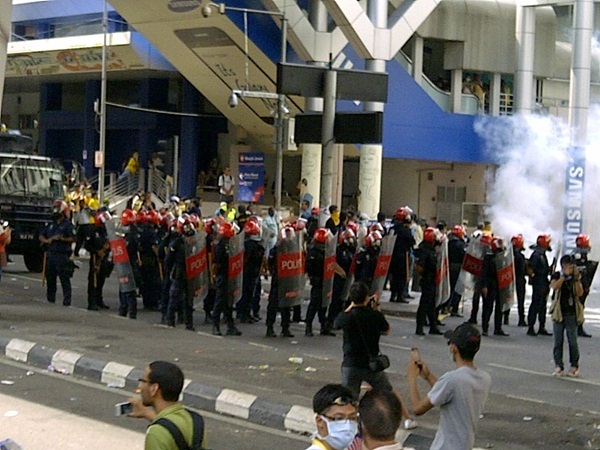 Before I knew it, I saw tear gas canisters flying through the air, and my heart skipped a beat. Everyone turn tailed and ran, but because there were too many people, there was a lot of jostling involved. We go out our towels, and water, and started pushing back through the crowd. Bb had to hang on tight to me to avoid from us being separated. At one point, there was so much pushing and shoving that I felt as if my feet were lifted off the ground as everyone tried to get to safety and out of the reach of the tear gas. My lungs felt like they were on fire, and my skin was burning. I was suffocating, and my eyes watered. I could only imagine how much worse it was for bb who gave me the towel and had nothing at all. He managed to get some salt, and gave it to me. 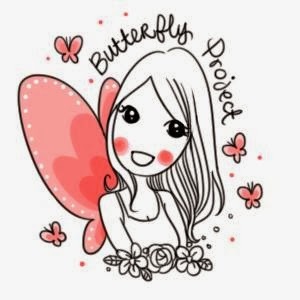 I felt better after that, and we made our way into an abandoned building, where there were many others taking refuge as well. 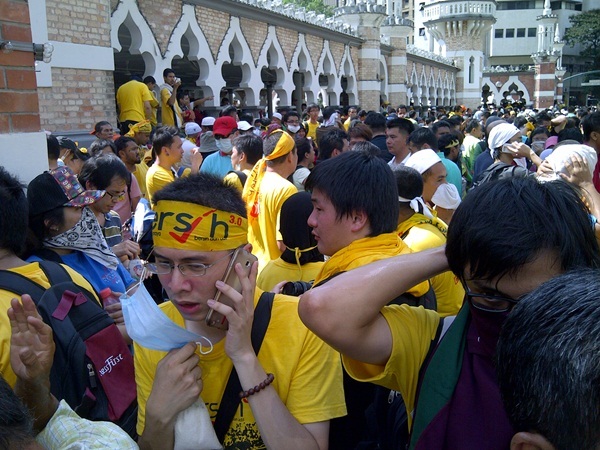 There were people offering salt everywhere, and guides to guide us out of the building to the back of it, where Masjid Jamek was. All along the road, people were calmly giving out instructions, telling us to wash our face, eat more salt, and stay calm. 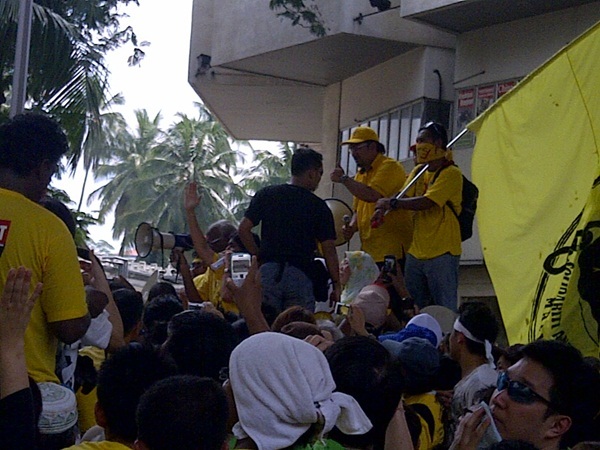 I really felt like I was in a war-torn country, where civilians were taking cover against a military junta. Look at those pained faces. Is this what you wanted? 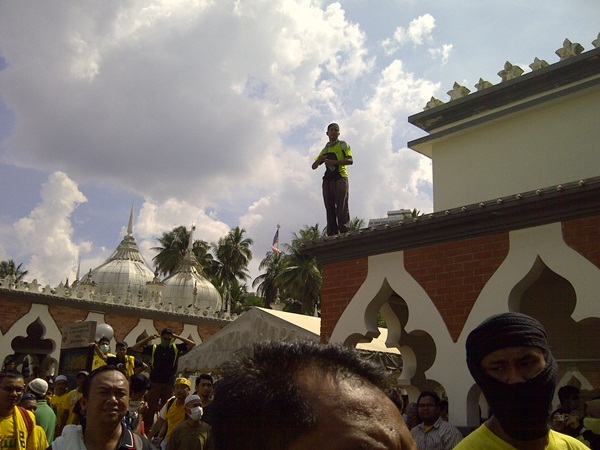 Even while we were in Masjid Jamek, we could see outside, and shots were continually being fired, over and over, even while the crowd was not doing anything to provoke them. Suddenly, we saw a group of people rushing into the Masjid, carrying a guy who was bleeding profusely. 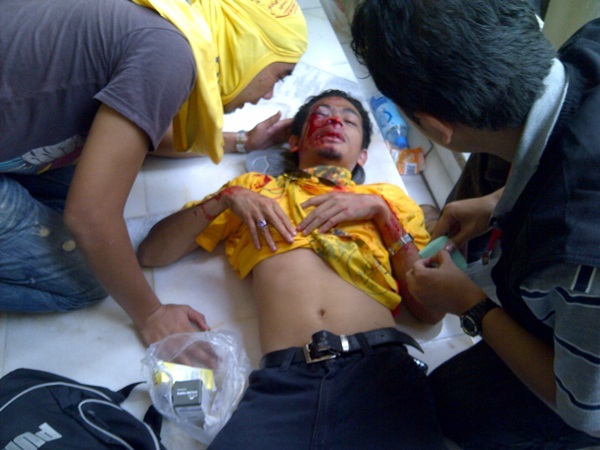 Apparently he had been shot in the face with a tear gas canister. I could only imagine the pain he was going through, and I thought to myself, how can the police, the very people whom we are putting our faith in to protect us, do this to a citizen of Malaysia? 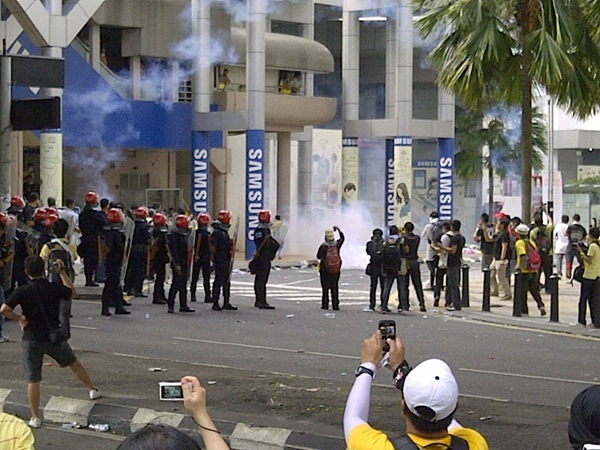 Tear Gas Canisters are supposed to be fired at an angle upwards, not aimed directly at the person. After a while, we decided to leave the premises. We wanted to go. But the stations were all closed down, due to reasons we cannot fathom. 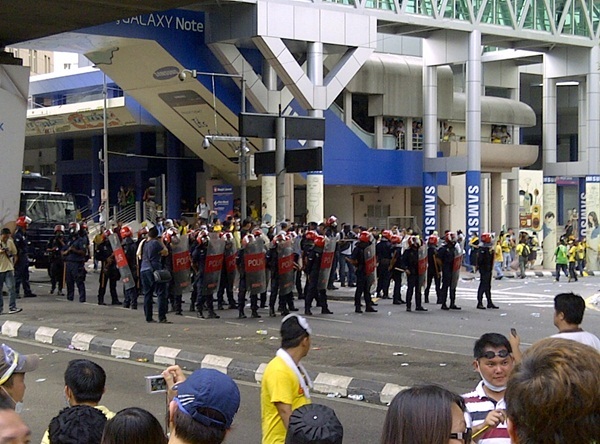 If they wanted the crowd to disperse, why would the stations be closed? 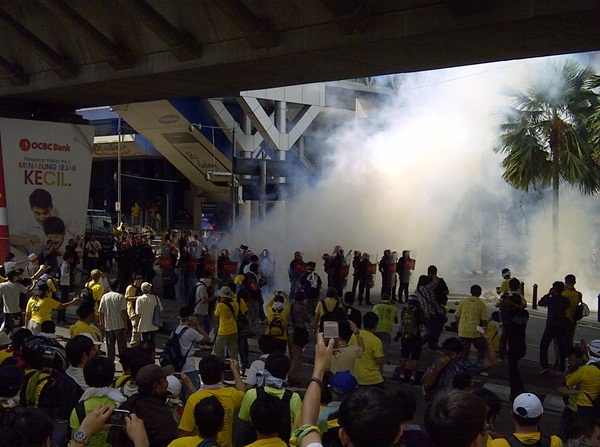 Tear gas canisters were being fired left right centre, and no one could get in or out cos the only way was via the LRT trains. We were like sitting ducks. Nowhere to go, and nowhere to run to shield ourselves. 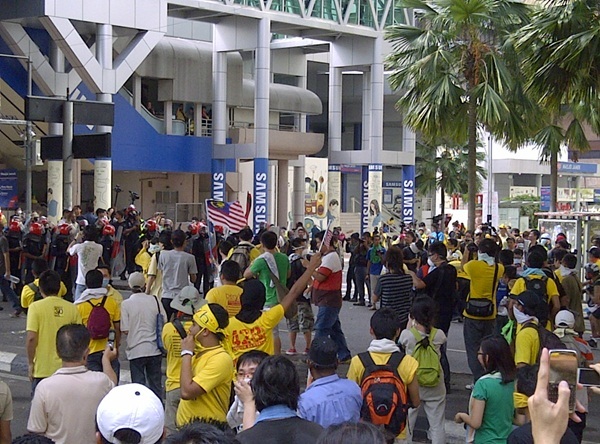 I read later in the newspapers that the RapidKL management wants to sue the organisers of Bersih 3.0 for damages to its property and stations around Ground Zero and loss of income. But let me pose these questions to you: If the stations were operating as normal, and people would have been able to get out easily and effectively, would you suffer these damages? If your stations were operating as normal, would you even have suffered a loss of income? 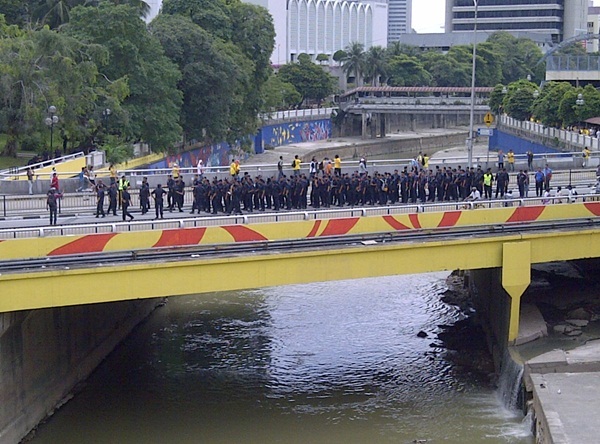 The police making their way from Dataran until Masjid Jamek. What were they doing there? weren't they just supposed to make sure no one enters Dataran? 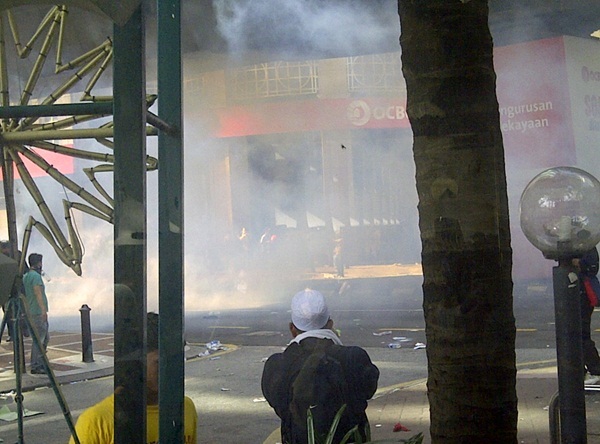 Tear gas canisters being shot directly at the crowd. Aren't you supposed to shoot them at an angle upwards??? There were many incidents that day that were untoward and regrettable. And as of right now, there is a lot of pin pointing going around, blaming each other for what happened that day. 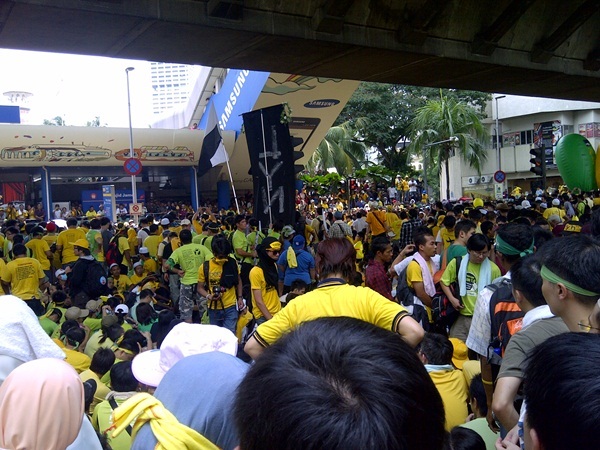 Reflecting back on Bersih 3.0, I would not say that either party were not responsible. Each one is at fault, one way or another. Like my friend Tiong said, when emotions run high, IQ and rationality runs low. There could be people planted there to make the situation go from bad to worse, but it’s not without provocation. 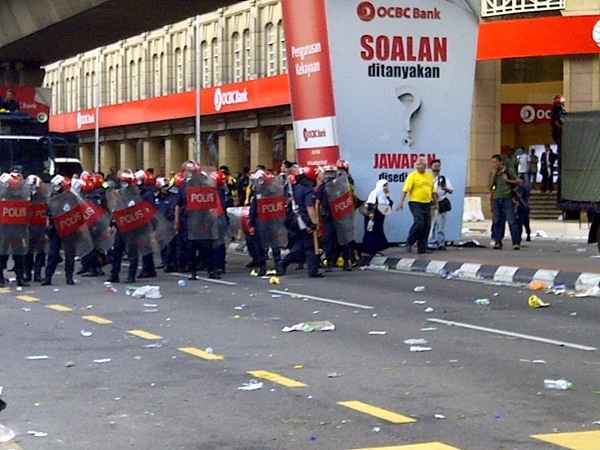 I believe that the police were under orders to fire only when the barricades were breached, but they should not have continued firing at those who were already dispersing, considering they only wanted to disperse the crowd. Looking back on this day, I am still convinced that many of us were not there to be violent. There were a few bad apples there on that day, but many of us came with peace in our hearts, wanting a cleaner and fairer election process. Along the way, I saw many Malaysians, from all walks of life, many different religions, all coming together for a cause they believed in. 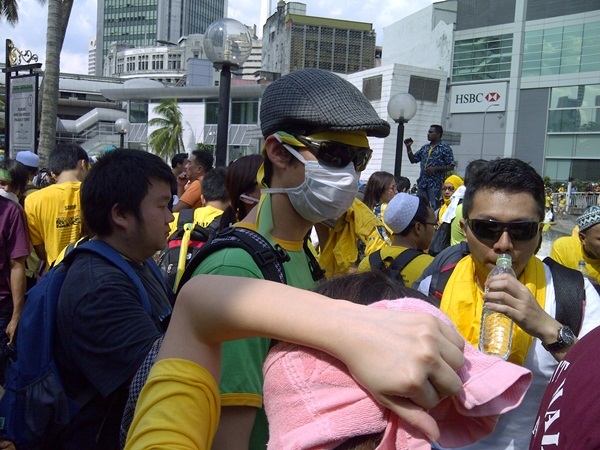 I saw Malaysians, all helping each other out when the tear gas canisters were fired. 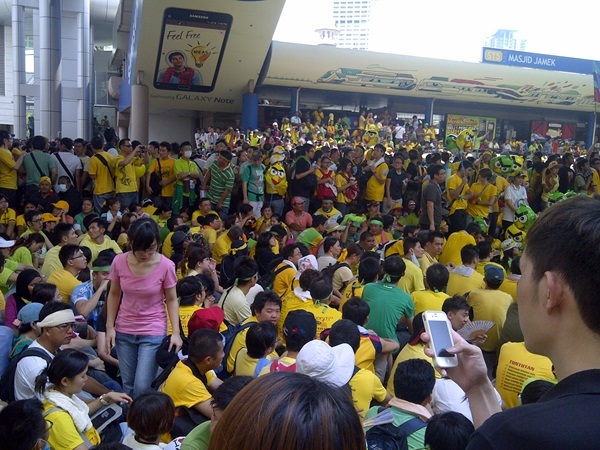 I saw Malaysians banding together to help an injured fellowman. I saw that despite religious differences, everyone was still courteous to each other. I saw water being offered to those who needed it, even though they needed it themselves. I was touched that the Masjid was open to everyone in need of shelter and sanctuary. 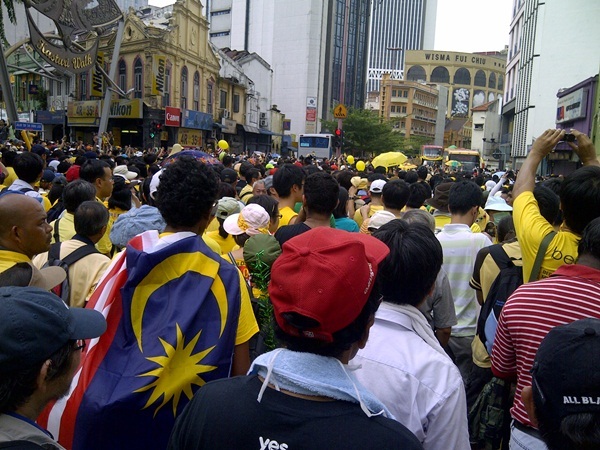 But most of all, I saw a spirit of the true 1Malaysia that we were all trying to achieve. And isn’t it ironic that that spirit was for something not pro-Gov? in the end, how u guys went home if the public transport is not operating?